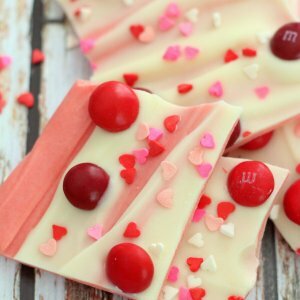 Easy and Delicious Valentine's Bark. Ingredients include vanilla candy coating, cherry m&m's, and sprinkles! Melt 6 cubes of candy coating in a small pot on low heat - stirring constantly. When all melted add pink or red food coloring. Pour over a baking sheet lined with parchment paper. Place in fridge for half hour. Melt additional 6 cubes of candy coating in a small pot on low heat - stirring constantly. When all melted pour over first layer and spread. Top with cherry M&Ms and sprinkles. Refrigerate for an additionall hour.